First of all, thank you so much for all the love you poured on my previous post. I wasn’t expecting such an amazing reponse, I am grateful and truly overwhelmed. 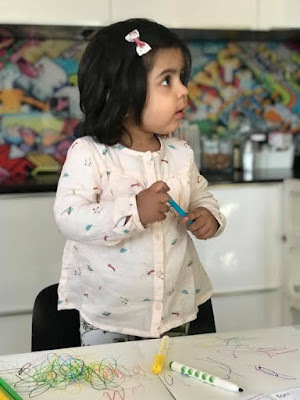 While thinking about what should I write on next, I had Raaya jumping around me like any other hyperactive 20 months old toddler does, which gave me the idea for this post. The absolutely must haves in our house which I use to keep Raaya busy and entertained, and thereby maintain my sanity the whole day long. Before I even jump on the list, I have to add. Raaya and I go out daily, no matter how bad the weather is. We went out to the soft plays and activity sessions when it was snowing and -2 degrees. She is happy when she is outside and of course they learn and absorb so much when they are out and about so even if it’s just to get some milk and eggs or a routine round of playground nearby – we go without a fail. It’s the only thing that works the best for us to burn all that toddler energy. Wipes – Now this sounds obvious with all the diaper changing but there’s so much more to it. Cleaning their grubby face or hands every 10 minutes, wiping that mushed strawberry from the floor, or letting them help clean. Raaya is obsessed with helping me around the house (All about that on my Insta stories), be it emptying the dishwasher, peeling eggs, picking the mint leaves off their stems, folding the laundry, and cleaning. So while I do the routine cleaning, she runs around the house with a wipe in her hands cleaning the furniture. It keeps her occupied, and I am convinced she is learning a thing or two. Fruits – You guys might have concluded by now that our house loves fruits. A panic prevails if we run out of avocados or bananas or strawberries. So if she is being fussy, a good bowlful of fruits never fails me. Little dining table – We had a high chair for Raaya in London which we had to sell off when we decided to move to Paris. Obviously, we got the same high chair here since she was eating happily back in London in it. But she rejected it, and I had to sell it off again. A mama from a lovely group that I am part of recommended to get a tiny table and chair for her. And honestly it has been our best purchase so far for the toddler version of Raaya. She runs to her chair when I serve the food or snacks. She is genuinely excited for the food time because it makes her feel like a grown up. Colours – Raaya is obsessed withs scribbling. I sneaked a quick shower and trusted her with colours the other day, and she amazed me. She sat on her chair and scribbled on the notebook while I managed to finish some chores. She now knows that she can only scribble in notebook so when I say colours, she runs to get the notebook. Colours and a notepad also make their way in our bag when we are out and about. Best way to keep her busy while we wait for our food to arrive. Books – Again this sounds obvious but I cannot emphasis enough on how good it is to have books for toddlers around the house. 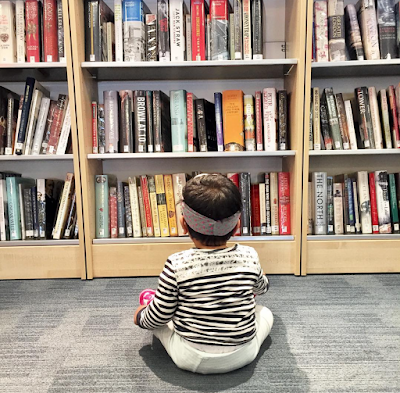 We started reading to Raaya when she was 6 months old, and over the time she has developed the love for books. If she is agitated or grumpy, books are our yet another resort. I just have to say book, and she runs to her tent grabs a book and sits in my lap. Although once we finish it, she runs back again to get another one and then another one and it goes on. She loves to point at animals, make sounds, or just kiss a baby picture in it. I am happy that so far we have been able to encourage her love for books, and I really hope that it keeps growing. Thank you again for all the love. Let me know if there’s anything specific you would like me to talk about in the comment box below, or you can always reach me on Instagram at www.instagram.com/@sameera_sood .